When it comes to crafting, I don’t need much bravery. 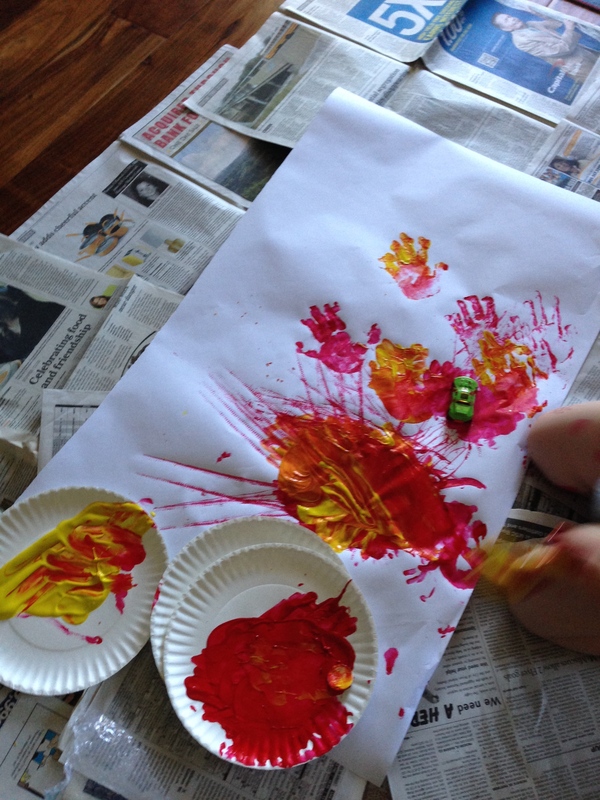 But when it comes to PAINT + My Toddler…. this Mommy needs more bravery than can possibly exist in one human. But, every time I get up the courage to haul out the paint, it ends up being a super fun time, and I’m always glad that I did it. So, for those of you who need bravery like me, and for those who love to let your little ones paint… here are some fun ideas to experiment with different textures. 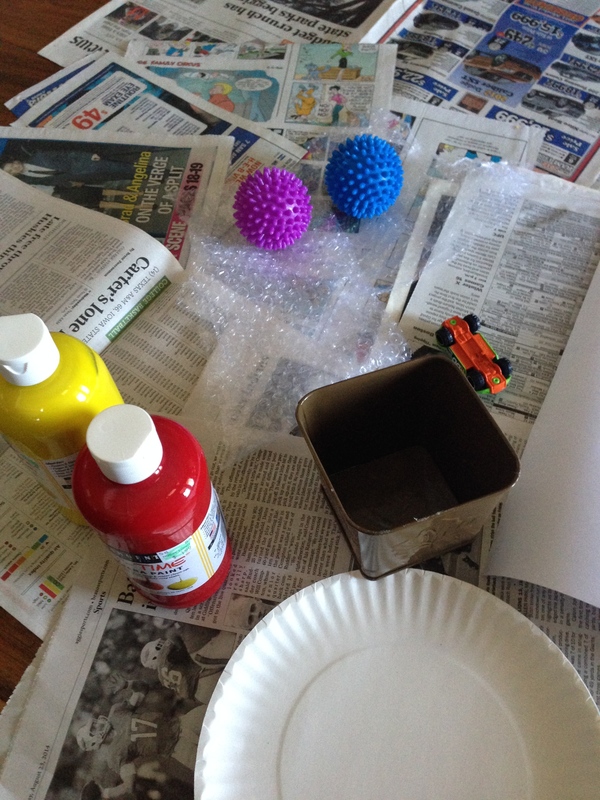 Supplies we used: red and yellow washable tempera paint, lots of newspaper (to cover the wood floor), big sheets of white butcher paper, and bubble wrap, dryer balls, a toy car, and a square metal votive holder for painting with. She first just finger/hand painted, but then she really got into using the car, and then the dryer balls. I was surprised that the bubble wrap wasn’t high on her priority list – since she loves to play with bubble wrap. 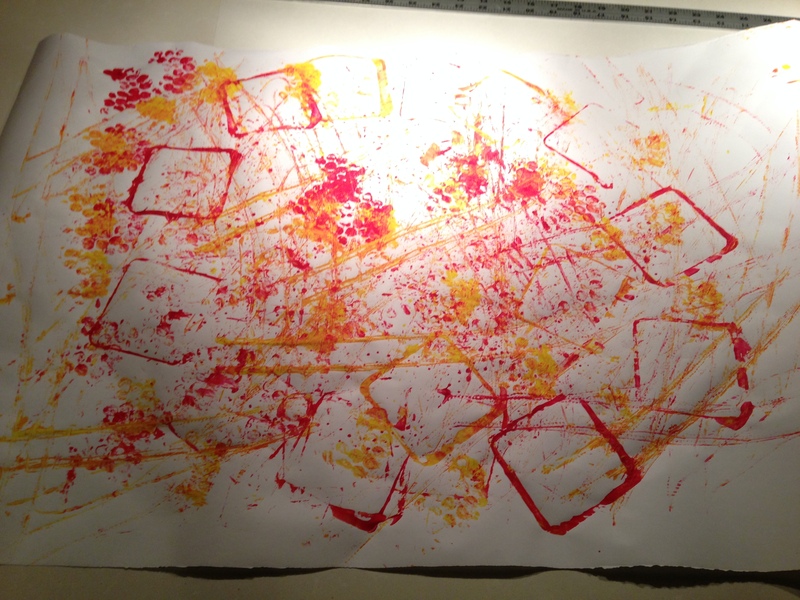 Her finished art actually ripped because she decided to walk on it, and put too much paint all in one spot. Still, she was super proud of her art! Once it is totally dry, I’ll cut the paper into a couple of different sections and use them as cards to send to the Grandparents. To keep myself from over-correcting her, and to truly just let her do what she wanted to do, I did my own painting right next to her. It was super fun, and helped me to relax and just laugh with her. When she was done, she decided to paint most of her body (I had her just in a diaper for this activity), so I carried her to the tub amid a burst of giggles, and we got her all scrubbed up. 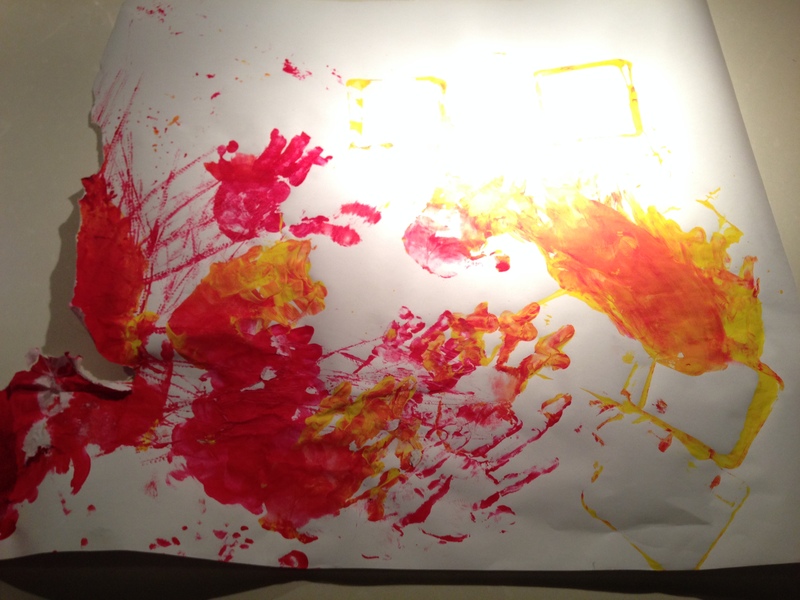 She enjoyed her impromptu bath, and was so proud to show Daddy her artwork when he got home.